As you see, every line (or row) contains the information of one device or partition. The first column contains the device name, the second one its mount point, third its filesystem type, fourth the mount options, fifth (a number) dump options, and sixth (another number) is filesystem check option. Let's take a closer look at this stuff. Most Linux distros create special directories for mount points. Most distros create them under /mnt, but some under /media. ... my floppy will be mounted in /media/floppy, because that's the default mount point specified in /etc/fstab. If there is no entry for /dev/fd0 in my fstab when I issue the command above, mount gets very confused because it doesn't know where to mount the floppy. As you've learned, these lines mean that /dev/hda2 will be mounted to / and /dev/hdb1to /home. This is done automatically when your Linux system boots up, if it wouldn't, you'd have a hard time using your cool Linux system because all the programs you use are in / and you wouldn't be able to run them if / wasn't mounted! But how does the system know where you want to mount /dev/hda2 and /dev/hdb1? By looking at the /etc/fstab file of course. 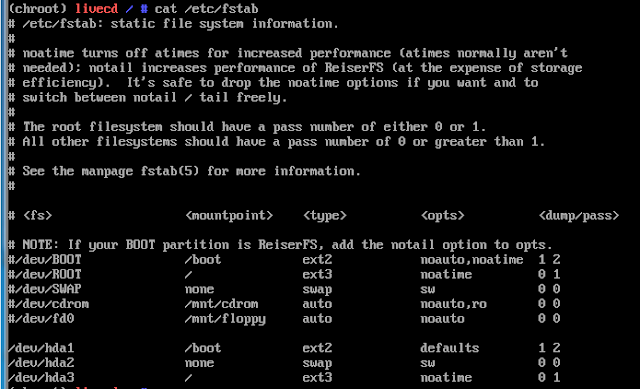 The third column in /etc/fstab specifies the filesystem type of the device or partition. Many different filesystems are supported but we'll take a look at the most common ones only. ext3 and ext4 Very likely your Linux partitions are Ext4 and ReiserFS. 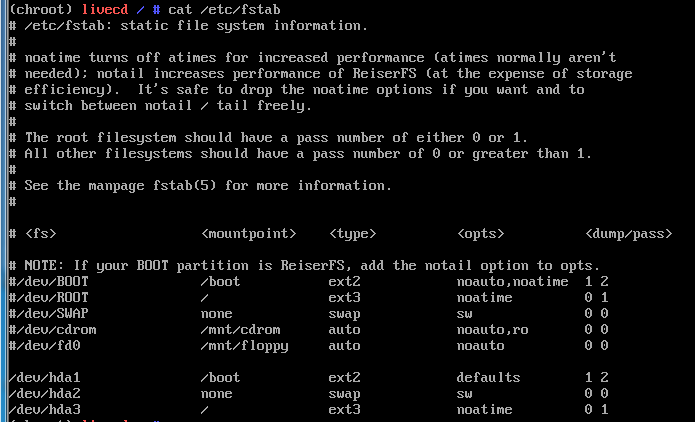 ReiserFS: Your Linux partitions may very well be formatted as ReiserFS. Like Ext3, ReiserFS is a journaled filesystem, but it's much more advanced than Ext3. Many Linux distros (including SuSE) have started using ReiserFS as their default filesystem for Linux partitions. swap:The filesystem name is self-explanatory. The filesystem type "swap" is used in your swap partitions. vfat and ntfs:Your USB stick is most likely formatted as Vfat (more widely known as FAT32). Your Windows partitions are probably either Vfat or NTFS. The 9x series (95, 98, ME) all use Vfat, and the NT series (NT, 2000, XP, Vista, 7) use NTFS but they may be formatted as Vfat, too. auto No, this isn't a filesystem type :-) The option auto simply means that the filesystem type is detected automatically. If you take a look at the example fstab above, you'll see that the floppy and CD-ROM both have auto as their filesystem type. Why? Their filesystem type may vary. One floppy might be formatted for Windows and the other for Linux's Ext2. That's why it's wise to let the system automatically detect the filesystem type of media such as floppies and cdroms. auto and noauto: With the auto option, the device will be mounted automatically (at bootup, just like I told you a bit earlier, or when you issue the mount -a command). auto is the default option. If you don't want the device to be mounted automatically, use the noauto option in /etc/fstab. With noauto, the device can be mounted only explicitly. user and nouser: These are very useful options. The user option allows normal users to mount the device, whereas nouser lets only the root to mount the device. nouser is the default, which is a major cause of headache for new Linux users. If you're not able to mount your cdrom, floppy, Windows partition, or something else as a normal user, add the user option into /etc/fstab. exec and noexec: exec lets you execute binaries that are on that partition, whereas noexec doesn't let you do that. noexec might be useful for a partition that contains binaries you don't want to execute on your system, or that can't even be executed on your system. This might be the case of a Windows partition. exec is the default option, which is a good thing. Imagine what would happen if you accidentally used the noexec option with your Linux root partition. rw:Mount the filesystem read-write. Again, using this option might cure the headache of many new Linux users who are tearing their hair off because they can't write to their floppies, Windows partitions, or something else. sync and async: How the input and output to the filesystem should be done. sync means it's done synchronously. If you look at the example fstab, you'll notice that this is the option used with the floppy. This means that when you, for example, copy a file to the floppy, the changes are physically written to the floppy at the same time you issue the copy command. defaults: Uses the default options that are rw, suid, dev, exec, auto, nouser, and async. Dump is a backup utility and fsck is a filesystem check utility. I won't discuss them in great length here, but I'll mention them, because otherwise you'd spend the rest of the day wondering what these things mean. The 5th column in /etc/fstab is the dump option. Dump checks it and uses the number to decide if a filesystem should be backed up. If it's zero, dump will ignore that filesystem. If you take a look at the example fstab , you'll notice that the 5th column is zero in most cases. This line means that the floppy is mounted to /media/floppy by default and that its filesystem type is detected automatically. This is useful because the type of the floppy may wary. Note especially the rw and user options: they must be there if you want to be able to mount and write to the floppy as a normal user. If you have trouble with this, check your fstab file to see if these options are there. Also note the sync option. It can be async just as well, but it's sync because of reasons discussed a bit earlier.